1. Mix 50g softened unsalted butter with half of the dill dressing from 2 x 145g packs Waitrose 1 Gravadlax, until smooth. 2. 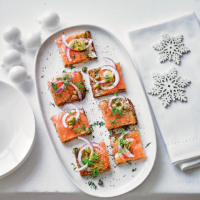 Generously spread 6 slices of rye bread with the flavoured butter, top with the gravadlax and drizzle with the remaining dressing. 3. Garnish with dill leaves, nonpareille capers and thinly sliced rings of red onion. Cut into small squares or slices and serve as canapés, or leave in larger pieces and serve with salad leaves as a starter or light meal.